Crossland College, Bramhavar was established by The Priority One India and The Priority Education Foundation in 1984. The College is affiliated with Mangalore University, Mangalore and accredited by NAAC with B Grade. The college with its sylvan surroundings is situated in Priority Highlands, the beautiful 30 acre campus in Chanthar village. Campus placements interviews were conducted for the final year students. NCC: The College has a unit of NCC. The unit attends the NCC National Integration Camp held at Haridwar, Uttarakhand from 3rd June to 13th June, 2013. Cross arts: This inter class competition is organized annually by the Social Science final year students. Crossroads: This is an intercollegiate competition organized for the students of colleges coming under Mangalore University. 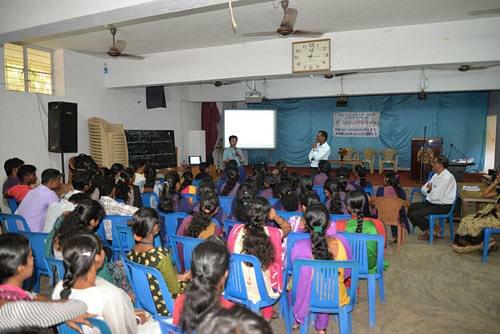 Last year 23 colleges participated. Crossnostalgia: The alumni association sponsors this inter class competition every year. Mr. Nathaniel T. Varghese secured IV Rank and gold medal in the University examination held in April/May 2010. Our students won the overall championship in the University level fest “PINNACLE-10” organized Moodlakatte Institute of Technology, Kundapur. Ms. Sowmya of III B.C.A. amd Ms. Sweetha Shetty of II B.A. won the First place in the inter Collegiate Udupi region debate competition organised by S D M College Ujjire and qualified for the finals. College team secured second place in Artshine 2011 conducted by Milagres College, Kalliyanpur. College team secured second place in Galactica – 2011 conducted by S M S College, Brahmavar.